ROME, Italy (CNN) -- Pope Benedict XVI launched his own channel on YouTube Friday in an effort to use new technology to reach a younger audience. Users of the channel will be able to follow the pope's daily schedule and his speeches. The slick site features the columns of St. Peter's Square in the background with links to official Vatican Web sites at the top. A large video player features prominently above clips of the pope and other Vatican officials. Users can view the site in Italian, English, Spanish, and German, and plans are in the works to include other languages, said Vatican spokesman Father Federico Lombardi. "With the YouTube platform, we now have the capacity to give young people direct access to the thinking, to the thoughts, to the words and deeds of the pope," said Monsignor Paul Tighe, secretary of the Pontifical Council. "That allows them to share that with their friends." The channel is non-profit, and the Vatican is neither giving money to YouTube owner Google nor receiving money for the channel, Lombardi told reporters. The Vatican will put no ads on the channel, he said. The Vatican plans to use it mainly as a news channel featuring the pope's daily activities and speeches, and it will provide links to other Catholic TV sites around the world, he said. Vatican TV and Radio will contribute greatly to the channel, and eventually it will have an interactive section so users can contribute material, too, Lombardi said. 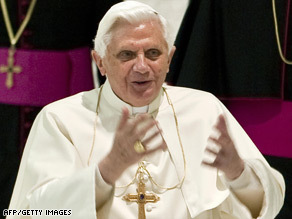 YouTube videos posted on the Vatican's channel included his Angelus message from Sunday. That was the most popular clip on the channel, with nearly 2,000 views by Friday afternoon; the second-most-viewed clip, with more than 760 views, was of the pope discussing the Internet as a "new way to speak to God." "The proclamation of Christ in the world of new technologies requires a profound knowledge of this world if the technologies are to serve our mission adequately," the pope said in a written message. "It falls, in particular, to young people, who have an almost spontaneous affinity for the new means of communication, to take on the responsibility for the evangelization of this 'digital continent.'" -- CNN's Hada Messia contributed to this report.